This is my favorite way to paint! Looks great! How do you do that! Thanks! Painting feathers is so fun! That reminds me, I sent you the feathers! Did ya get them? I sent them on Tuesday. I should try feather painting sometime. It looks like fun! Location : You'll never find out! I'm going to paint one of Wendy's pied feathers! Budgielover14 wrote: That reminds me, I sent you the feathers! Did ya get them? I sent them on Tuesday. I need to check the post office today. I'll let you know if I got them! And you should try it, it is fun! Ok! Let me know. I will mail you any extras I find later on. I think I will try feather painting! Budgielover14 wrote: Ok! Let me know. I will mail you any extras I find later on. 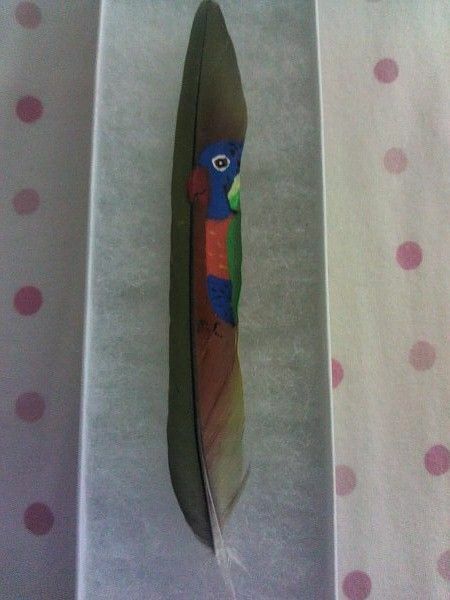 I think I will try feather painting! I checked my PO box yesterday, and I still haven't gotten them yet. I'm checking again tomorrow. Oh dear....hopefully they haven't gotten lost in the mail... If you don't get them I can always send you more. Wow, feather paintings are so cool! I've never heard of them until I joined SA! You will never lose until you stop trying.